Think it would be fun to grow cilantro in a flower pot? Well, it's very easy to do! 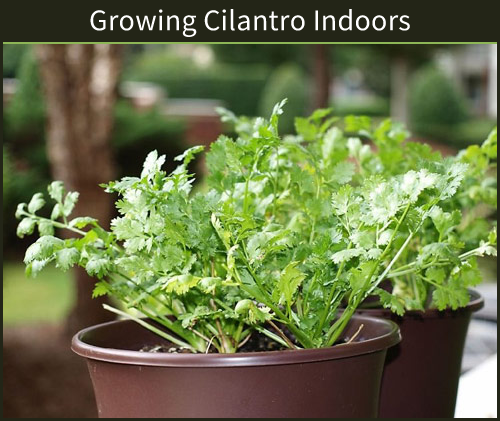 The best part is that it is not only easy to do but think of what you can do with fresh cilantro growing indoors during winter! Salsa anyone! 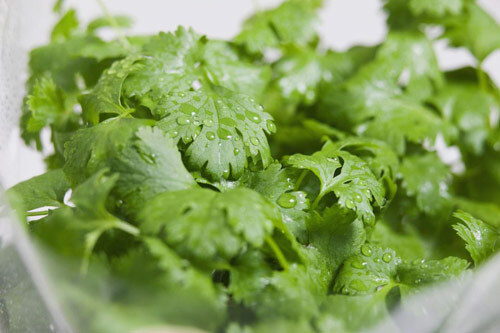 Cilantro grows best in cooler temps. 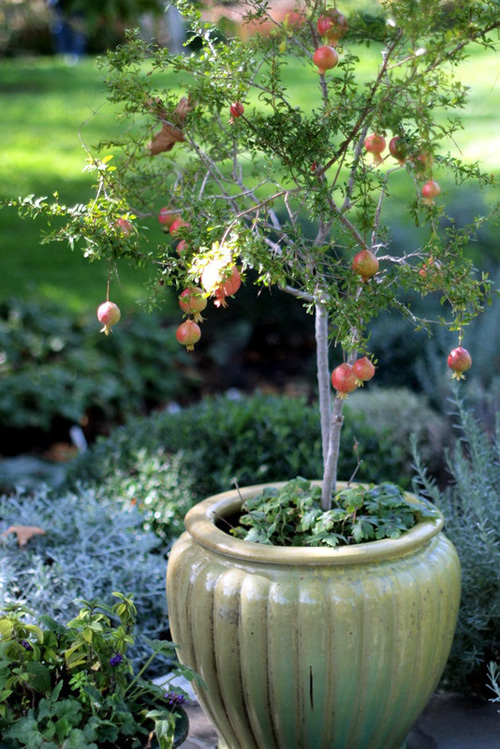 It does well when potted outside in spring, fall and even early winter. Unfortunately if you want to grow cilantro outside during the summer it will go to seed fast and end its' growing life. So the best thing to do is fill a garden pot with it indoors and have it available all year long. Start by filling with potting mix. Cilantro likes all kinds of pottery so this is the time to choose a planter that matches your home decor. Just make sure that there is a drain hole. No herb not even cilantro likes to have it's roots sitting in stagnant water. Water the potting mix now and get it damp. Make sure the overflow comes out the bottom of the pots drain hole. Sprinkle the cilantro seed over the surface of the moist soil evenly. Cover with 1/4" of potting soil and mist it with water to moisten. Now is the time to start misting the soil to keep it moist till the seeds germinate. Take the pot and place in direct sunlight. Hopefully the potted cilantro will get 6 hrs of direct sunlight per day. Mist the soil when it begins to dry out and keep misting for 7 days till germination. 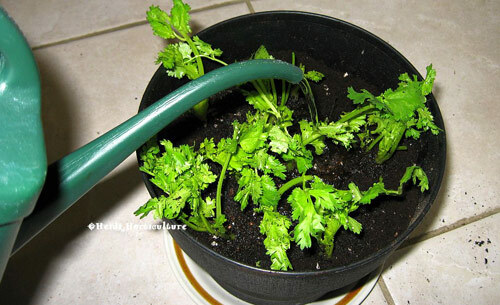 Now water the plants when the top soil dries and rotate the pot so that all sides of the cilantro get sunlight. Here is the fun part. Harvesting the cilantro leaves. Wait till the indoor potted plant grows 4" in height and have full size leaves. 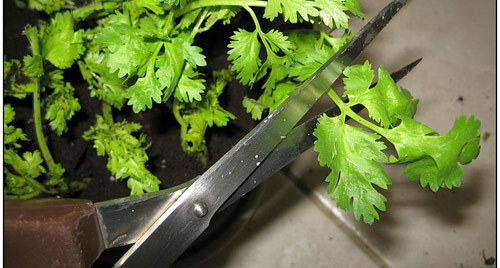 Cut the leaves with kitchen shears leaving at least one set of leaves on each plant. 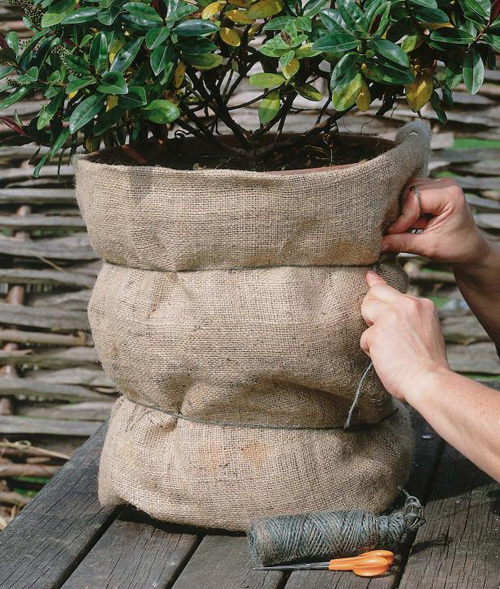 We recommend you harvest off different sections of the pot so that each plant has time to regrow. Lastly fertilize the potted cilantro when the plants are 6 weeks old. This will help to keep the grow steady and healthy. Now top salsa with these beauties and enjoy. [Read More] Pot Tips To Use Everyday. potted cilantro, planted cilantro in a garden pot, pottery filled with cilantro, how to grow cilantro in a pot. Try to get some of these fall garden chores done before winter arrives. If you spend the time to do these chores now then you will be well on the way for a Spring garden that will shine! These aren't hard garden chores to do but just simple things that will make your garden easier to manage. Clear out all dead or dying plants, flowers or shrubs. Cleaning up dead leaves and flower head is easy to do and so important. 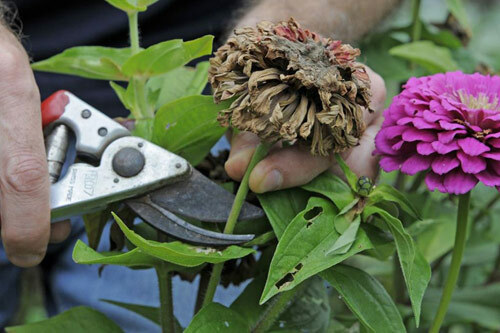 Dead plants attract bugs and other unwanted pests. These pests like slugs are always looking for a warm spot to weather the winter so keep dead plants and leaves up off the soil and ground. Also now is the time to deadhead any remaining plants in your garden pottery that are still growing. Clean around the top of the pots taking out leaves and weeds that may have grown. Keeping everything clean is good for your garden and planters. If you see any sick or dead plants take them out. Don't leave anything that will attract bugs. Don't compost them but toss them in the trash. If your potting soil looks spent toss it out and clean out the pot for next year. Don't keep soil that may have had diseased plans in them or show any kind of weeds or pests. If you are keeping the soil then clean it up taking out any dead object and cover with rocks, pot toppers or hay. This will keep the soil in good condition for next Spring plantings. Plan on adding some fresh soil next season. Now is the time to bring in any pots that won't survive being outside for Winter. Move all fragile garden pots to the garage. If that isn't an option then move under eves next to the house and cover with a tarp. Not an option, cover the soil with hay, rocks, broken pots materials or anything that will help to keep water from getting inside the pot and freezing. The frozen water is what causes the cracks. Any remaining decorative garden items can now be stored and put away. Clean everything up so that you will have a fresh start next year. Many painted items don't like the cold freezing weather and could have flaking or fading issues so take them inside. Lastly, take a final look over. Clean up any thing you may have second thoughts about. Know in your heart that the next planting season will come soon enough and all the work you are doing know will pay off. 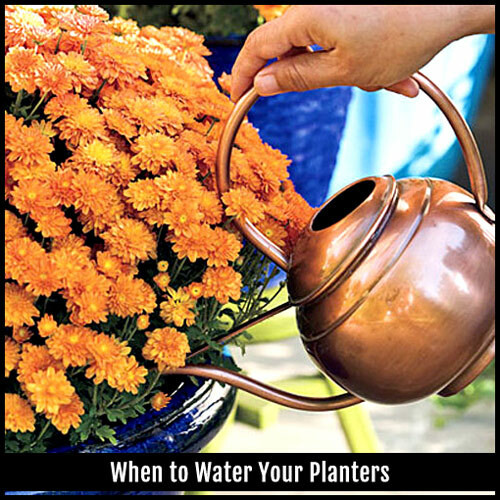 [Read More] When to water your garden planters. These days everyone is thinking about down sizing. Moving into tiny houses and getting rid of huge yards that take upkeep, money and time to maintain. 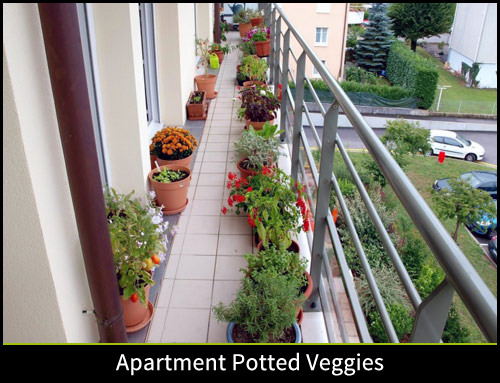 If you find yourself in an apartment, condo or high rise here are few tips for potting up a few veggies. You don't need a large plot of land to grow a few fresh and healthy vegetables, especially if you do them in terra cotta pots or bowl pots. Even lots of folks with homes prefer to grow vegetables in garden planters and pottery. It makes moving them easier and more portable. You can place the pots by a back door for convenience or on a patio for fragrance and color. 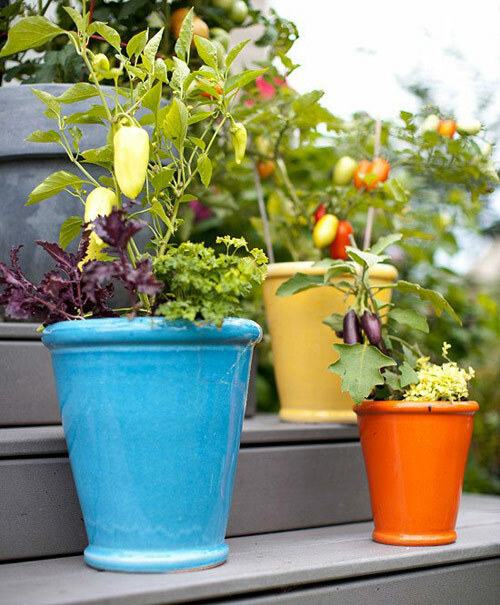 However if you are living in a smaller space you can still grow fun vegetables in flower pots. Make sure you select clay planters that have a drain hole and leave some room for the vegetable root systems to spread a bit. Many vegetables have short roots so even a garden bowl on a patio table can work nicely. 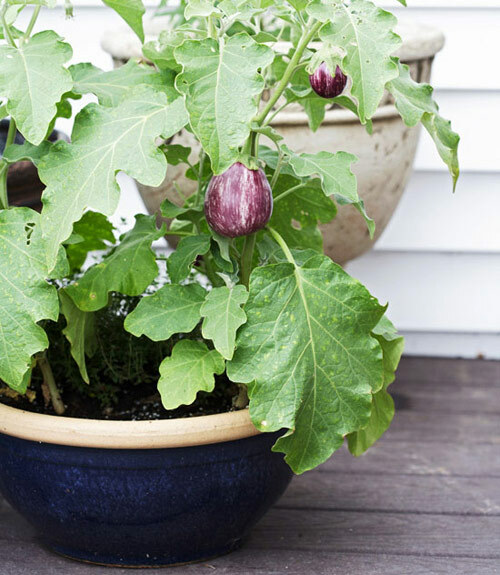 Fill talavera planters or mexican pots with leaf lettuce, spring veggies, and herbs. 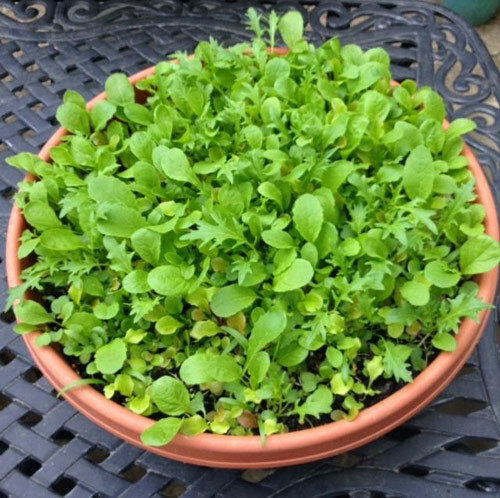 They all work great in garden bowls that don't need much room and can be fairly shallow. However if you want to grow veggies that climb like tomatoes, snow peas or green bean you will have to put a metal cage in a large pottery planter, and use a garden trellis near by or place the clay planter next to a patio wall or balcony rail where they can climb as they grow. If you really want to get daring you can even grow melons, or pumpkins where the roots are in the garden planter and the fruit is resting on the patio or deck as it grows. Think about easy items to grow like green onions, carrots or radish when you are not up to a big challenge. These are easy, don't take much room and fun to eat and watch grow. Besides a good container you also need to consider how much sun the planter will get. Read the packet of seeds or the starter veggie plants for how much sun the containers will need. Make sure you start with good, new potting soil and fertilize on a regular basis. 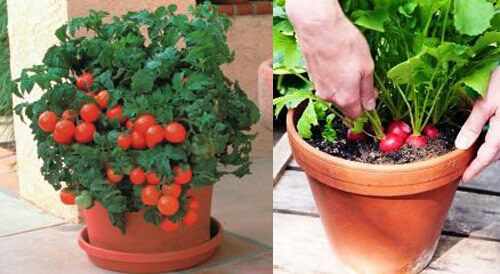 Since these potted veggies can't draw water or nutrients from the ground you need to keep the potting soil healthy. Lastly, don't worry about watering them. Many times a watering can will work just fine. 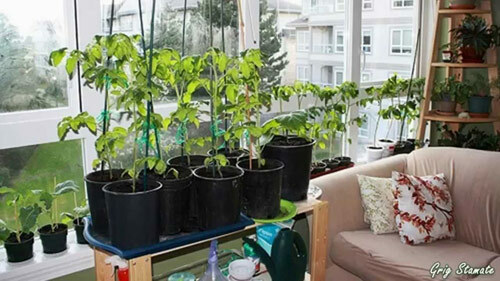 The main goal here is to just have fun, and enjoy eating and harvesting your own vegetables right outside on your balcony or small patio area. 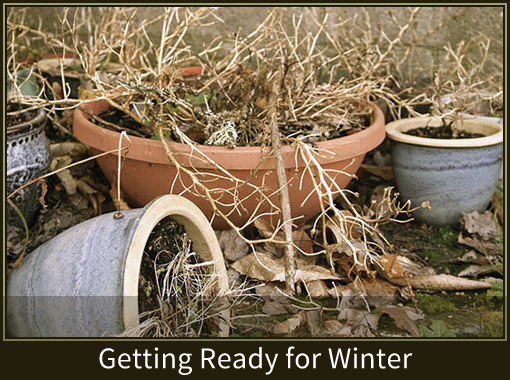 [Read More]Protecting Your Garden Planters For Winter. 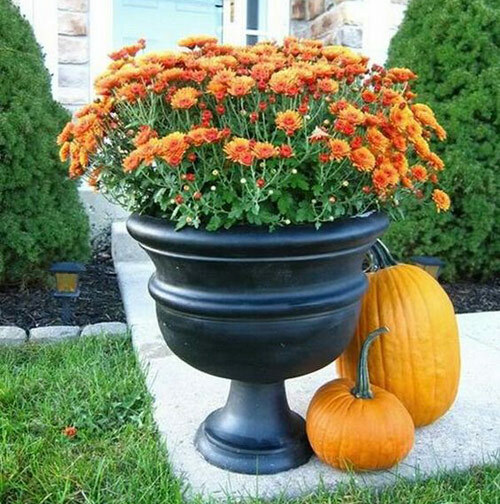 Every fall millions of gardeners find themselves cleaning out their summer planters and replacing them with fall flowers and shrubs One of the most colorful, decorative and easy plants or flowers to grow are mums. You will find tons of colors to choose from at your local garden center or nursery. Orange, Reds, Yellow and more....all healthy and lovely waiting for you to take them home and create a fall display of color in your terracotta pottery or glazed garden planters. Here are a few tips to help you to keep your pottted mums looking their best for as long as possible. Select only potted mums that have deep green leaves and look healthy. No yellow or wilted leaves please and make sure the flower heads look moist and healthy. This is not the time to nurse back a dried look plant that has wilted. If you have a choice of wilted leaves and dried heads or nothing we recommend nothing. Don't waste your money on these sick mums. Next realize that mums like lots of water. Keep the soil moist but don't let the plants roots sit in standing or over moist soil. This will encourage root rot and your potted plant will not survive. If you are re-potting into your decorative home and garden planters and pots please use new potting soil. Old or used soil can contain moss, mold and insets that can harm a healthy plant. Make sure the potting soil you use is well draining and meant for mums. You can fertilize potted mums but it is not necessary. 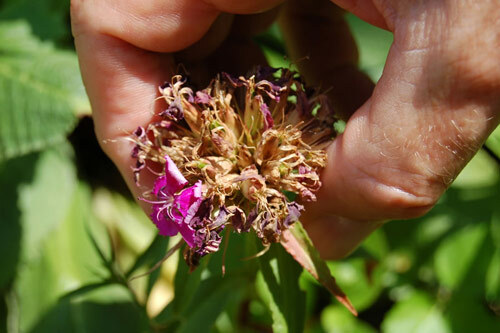 Deadhead any blooms that look spent and remove dried or wilted leaves when they happen. 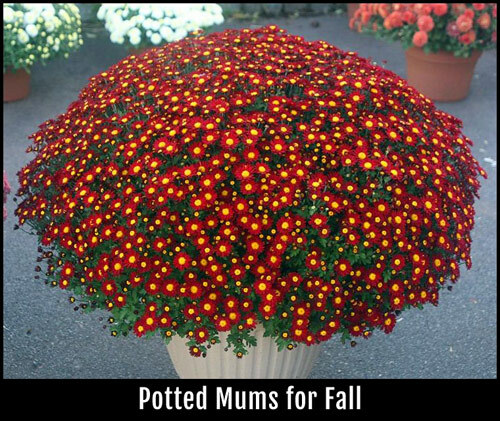 Mums will not survive a cold winter so expect them to look lovely all thru autumn up until winter. When the weather cools and your garden containers look like they need a lift for fall, this is the time to pot up some colorful, flowering mums. 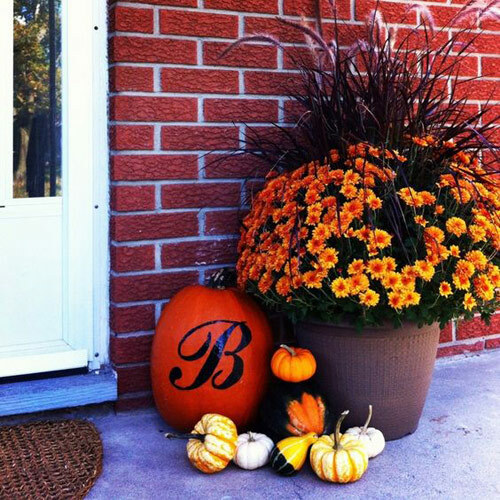 Mix them up and tuck a few small pumpkin or gourds between the plants for a special touch. When To Water Your Garden Planters? You selected the perfect garden planter, you researched and purchased the best kinds of plants and now you ask, When is the best time to water? Good question. 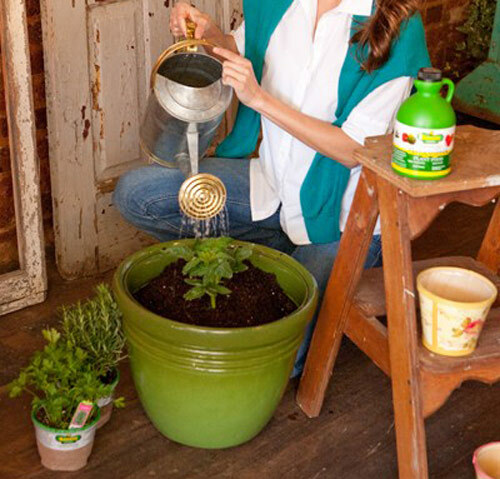 You want to make sure when it comes to watering your potted plants you get it right. 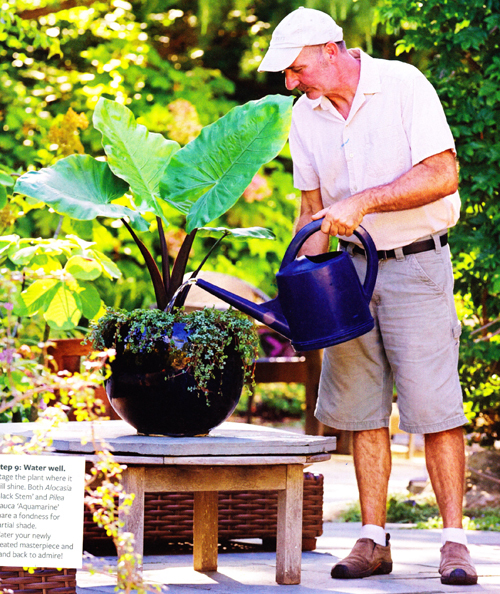 Of course we all know that too much or too little can kill most plants and make those garden planters look pretty bad. First you must make sure that your garden pottery has drain holes. Even succulents & cacti don't like to sit in standing water. Then early morning is the best time to water your planters. This is because the sun is barely up and the temps are still pretty cool. Now is the time that water can penetrate the soil and get down to the roots before being evaporated by the sun & heat. 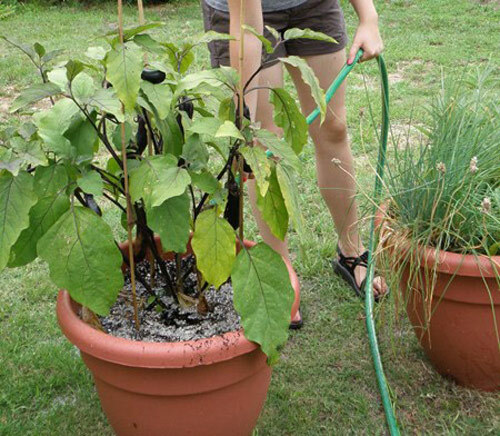 Watering your planter early also means that the plants will have time to soak up and store some of the water before they are dried out and waiting in the afternoon. Don't believe that spraying the leaves of the potted plants and then having the full sun hit them will scorch them or cause burning. That is simply not true. The second best time to water your potted garden planters is late afternoon or early evening. What you are trying to do is to avoid watering your containers in the middle of the day. If you wait till early evening try not to get water all over the plants leaves. Letting the water sit on the leaves can cause pathogens and disease. So if you have a choice always go with morning or late morning. Do NOT water at night. You think it's a good time to water your planters so that they can soak up all that moisture but it really causes disease like stated above because there is not evaporation. So to rap this up, here are a few last tips. Don't overwater - look for limp or soggy leaves, rotting at the stem or tips browning. Water consistently over the surface of the soil and not your leaves. When you water, water deeply. The deeper the better for encouraging the potted plants roots to spread throughout the planter. 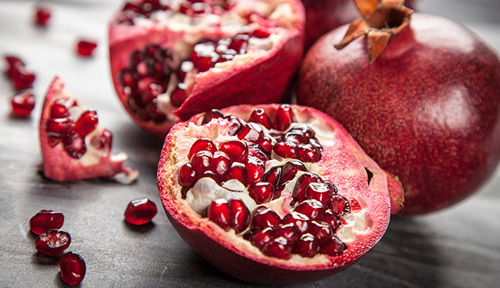 [Read More]18 fruits you can grow in containers. [Read More] Poisonous houseplants for dogs. As the years go by you find yourself collecting more and more garden planters. Many of them are very expensive or just ones that you love very much. So of course you want to protect them from Winters cold and damage. Here are a few tips that may help ease your discomfort. Before anything you need to clean them out and clean them up. Of course this is only for garden pottery that is empty and being stored. Start by dumping the soil into a compost pile or recycle can. You will not be using it again so it has to go. You do not want to pass on any bugs, mold or fungus that may be growing in the soil so get rid of it and start fresh next season. Use a wire or stiff bristle brush to scrub off any chunks of soil that are sticking to the inside of the flowerpot. Then mix a bucket of 1 part bleach to 10 parts water. Now scrub the inside with the bleach mix to disinfect the pot and make sure any thing that may be still attached to the insides are killed or removed. Let the pots dry completely before storing them in the garage or shed. 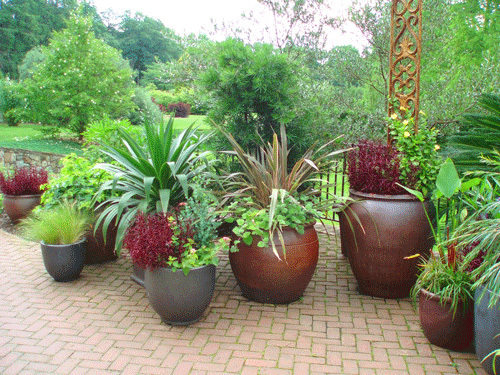 Ideally all garden pottery and planters should be stored indoors over the winter months. May planters are frost resistant but not frost proof. This means they can handle light frost but not freezing weather. If there is standing water from rain or drip system in the soil and the soil freezes, the water will expand and crack the planter. If you are leaving the empty planters outdoors, try flipping them over and use bricks, pot feet or wood to keep them off the ground. You can cover the empty containers with a large garbage bag to keep the water off or cover with burlap wrap. 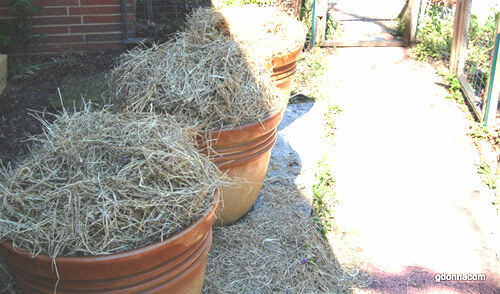 If you can't flip them then just fill them with hay or mulch to protect them from the water and cold. If you can't move the garden planters and need to keep them planted then you need to top the pots with mulch to keep the water out and the roots from freezing. 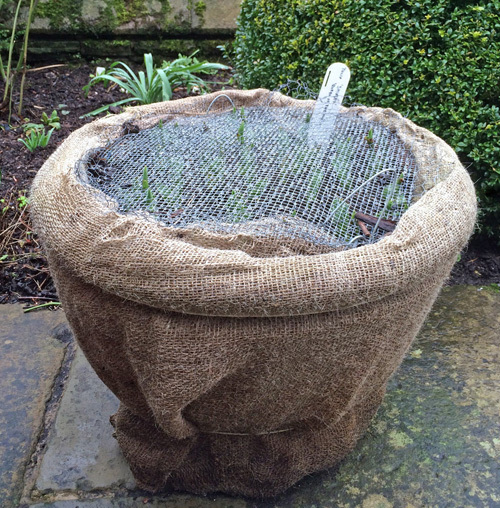 We like wrapping the planter with burlap and string to help. Plastic bubble wrap works etc. We know it's not the most beautiful look but if it saves your planters from cracking it's well worth it. The only exception for all the above information is a terra cotta flower pot. Terra cotta is porous and absorbs water like a sponge. This is healthy for the plants but obviously bad for freezing water conditions. 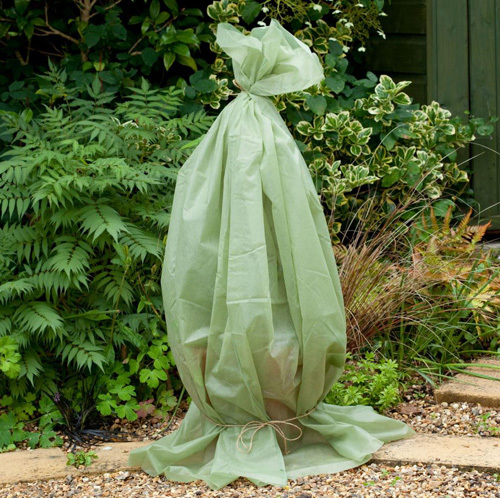 If you can't bring them in, get the pots off the ground, wrap in a waterproof bag or tarp and move them under a roof eave so water doesn't directly hit them. If you can't do any of that then at least lay down a thick layer of mulch or hay to protect the top soil. 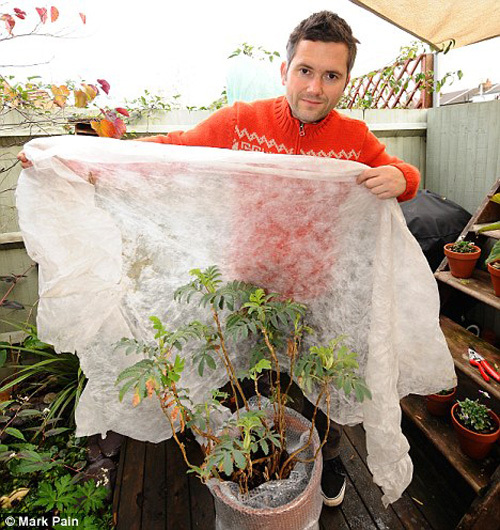 Hope this helps and you find some of these tips for protecting your garden planters from freezing during Winter work. [Read More] How to Create A Faux Weathered Flower Pot. 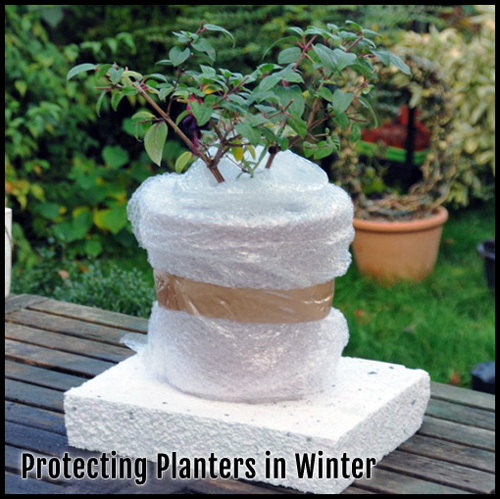 winter protection for garden planters, overwintering pottery, winter planters, protecting garden pots in winter. We love the see the different fruits and veggies that can be grown in garden containers. 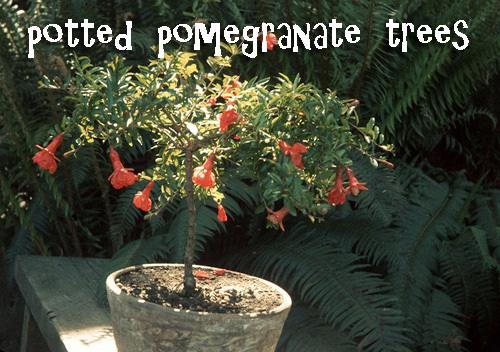 This post is about a potted Pomegranate tree. They are easy to grow, cold hardy and beautiful along with tasty. Check it out. Why do we say growing a potted pomegranate tree is easy. Well they have shallow roots compared to other fruit trees and that makes them easy to pot in a garden planter. Each plant has lovely green leaves and delicate bell shaped flowers that are stunning in a bold bright red color. When they bear fruit they look like large red apples with a hard shell that hide the juicy sweet seeds inside that are edible. So here are a few tips that should encourage you give this lovely plant a chance. Choose a sunny location. The more sun this plant receives the better your chances are of bearing fruit. 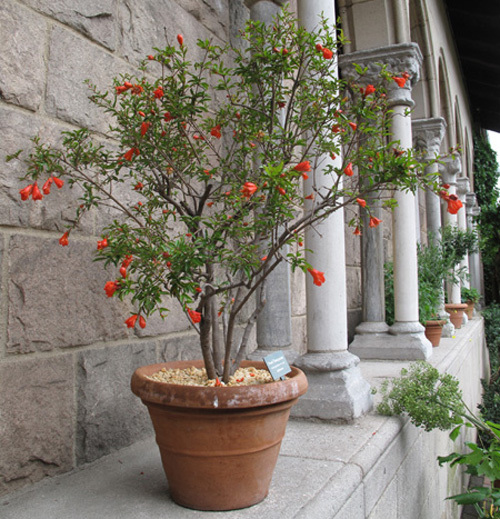 If for some reason you can only place the pot in a partial shade location it will still bloom but have less fruit. Soil for potted pomegranate trees should be loamy and loose. Make sure to use a potting soil for fruit trees for the best results. During the growing period the water requirement is medium to high. So we recommend watering regularly and deeply. Of course don't water log it. 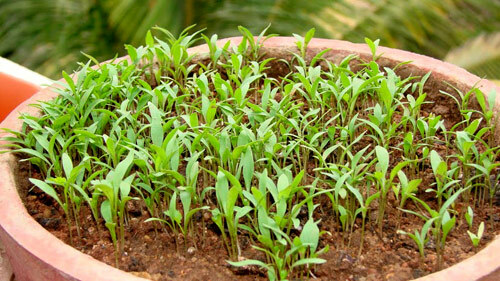 It is best to fertilize regularly to help it achieve the best growing and blooming results. Pruning will be necessary to encourage flowering and fruit so remove weak, or dead branches. You shouldn't have an issue with disease but if you do treat it right away. The last thing to consider is repotting. If your pomegranate tree becomes root bound wait till there are no flowers or fruit on the tree and move it into a larger planter. 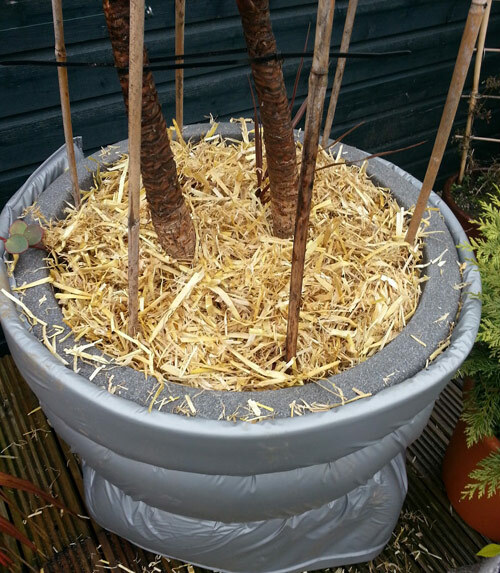 If moving it into the garage during winter is your plan then consider using a light weight poly resin garden planter. 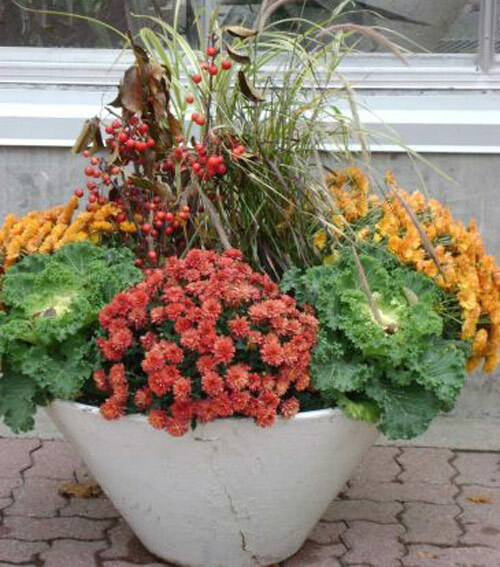 Otherwise concrete, terra cotta, ceramic or fiberglass planters will work. Just make sure the tree's roots always have some room to grow. Well hope these tips help. If you would like to share your experience we would love to hear from you. Good Luck! 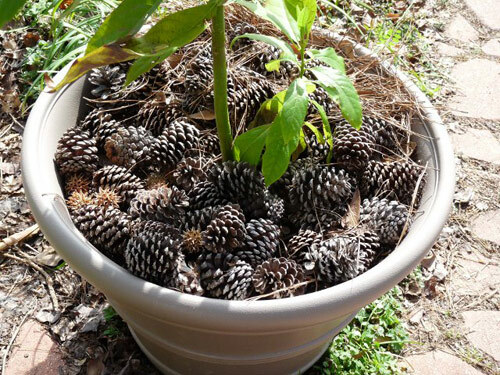 [Read More] Growing a tree in a pot. [Read More] Potted Olive Trees. 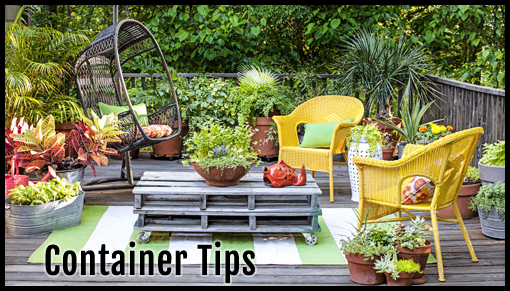 Finding the most beautiful and healthy plants and flowers for your garden containers isn't that hard to do. Most local nursery and garden centers carry a wide selection that are mostly healthy and lovely. Now keeping them looking that way for as long as possible is the goal of every container gardener. By following a few tips listed below you are well on the way to achieving that goal. 1. Pick the perfect garden pot. Make sure you get the right size before anything else. You do not want to put a palm into a pot that is so small it tips over in a robust wind or so little that it cramps the roots from growing and spreading. All plants and flowers have roots that need room to grow in soil that has nutrients in it. 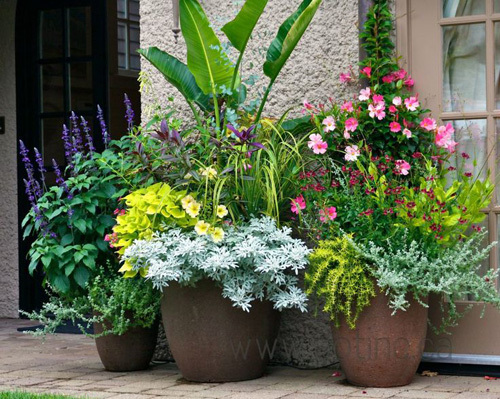 If a container is too large it can result in over moist soil and drown the roots. If you have a lot of space in the pot and you keep the soil moist, you may get moss and mildew issues that are not welcome. Also make sure you garden container has drain hole. No standing water in flowerpots is recommended. 2. Plant you new pottery container with a plan. It seems harmless to just dig in and go for it but the result will not be as successful if you follow a few steps. Make sure you use plants with the right light needs with where you are putting the finished pot. A plant that needs full sunlight will not grow if you place the garden planter on a covered porch that sees mostly shade. Try to mix flowering plants and colors with green foliage to fill in the planter and make them look overflowing and full. Just make sure they need the same amount of water. 3. Be selective about the potting soil you use. Never use garden soil for many reason but mostly you will NOT have healthy plants. If you plant succulents make sure you are using pumice soil that drains well. If flowers are more to your liking a nice potting mix that has compost in it works great. Don't recycle potting soil if you had diseased plants growing it in already. Start fresh! The main thing to remember here is never underestimate the power of the correct potting mix. 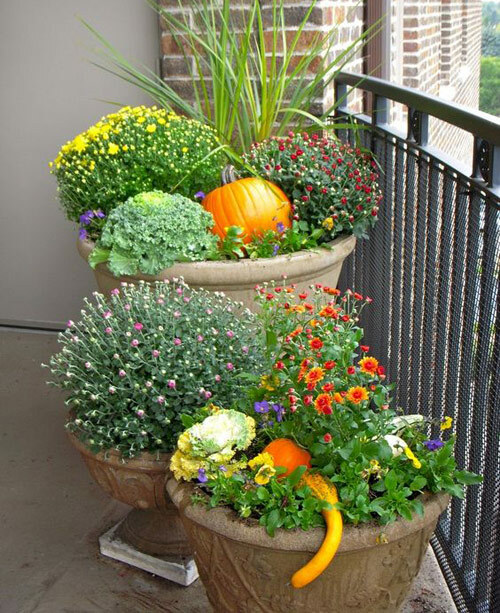 So follow these easy steps and you are well on the way to have garden containers that look stunning all season long. [Read More] 18 Fruits you can grow in garden containers.